If you’ve never been white water rafting before, you might have some misconceptions about what it’s like. Don’t worry; you’re not alone! Incorrect information and myths spread quickly, but fortunately, Smoky Mountain Outdoors is here to set the record straight. In this blog, we’ll debunk five of the top misconceptions about Gatlinburg TN white water rafting. While there is inherent risk in any sports activity, Smoky Mountain Outdoors has a stellar safety record. All of our guides are Standard First Aid certified and have made dozens, if not hundreds, of trips down the river. Every adventure begins with 20 minutes of safety instruction and there is ample time to ask questions. Additionally, each raft is equipped with a waterproof first aid kit. Believe it or not, you don’t need to know how to swim to enjoy a white water rafting adventure! All of our guests wear Coast Guard approved life jackets, so in the unlikely event that you fall out of the raft, you’ll float comfortably until you make your way back onto the boat. The only exception to this is our Upper Pigeon River Extreme Rafting trips, which do require the ability to swim. For all of our Gatlinburg TN white water rafting trips (Upper Pigeon River Extreme excluded), absolutely no prior experience is necessary. In fact, Smoky Mountain Outdoors specializes in first timers. During your rafting adventure, your guide will tell you when to row, when to stop, and everything else you need to know. As long as you can follow simple instructions, you’re qualified to go rafting! 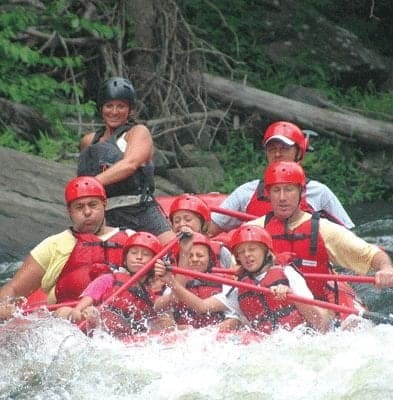 Don’t get us wrong; white water rafting can be a thrilling, high-octane experience! However, you don’t need to be an adrenaline junkie to have a great time on the river. Smoky Mountain Outdoors offers a variety of rafting experiences, so you can pick the one that you feel comfortable with. Featuring mostly Class 1 and 2 rapids, our Lower Pigeon River Rafting trip is ideal for people looking for a mild ride and is popular with families who have younger kids. Guests who feel a bit more adventurous will enjoy our Upper Pigeon River Rafting trips, which feature Class 3 and 4 rapids. As mentioned above, our Upper Pigeon River Extreme Rafting trips are available to guests with previous experience who are looking for a truly wild ride. While the scenery you’ll enjoy is absolutely stunning, you won’t be out in the middle of nowhere! Our rafting outpost is just a 45 minute drive from Gatlinburg, TN, one of the most popular vacation destinations in the Southeast. You can either stay in town, or enjoy a night of camping at Pigeon River Campground, which is literally steps away from Smoky Mountain Outdoors. Offering campsites for tents, campsites for RVs, and camping cabins, Pigeon River Campground is a great option for folks who want to stay close to the action. To see what it’s like to have a rafting adventure with us, check out our Gatlinburg TN White Water Rafting Videos!